Whether you are in a big or boutique law firm, you’ve probably thought about which marketing strategies for lawyers can help boost the business. Based on research found in a study by the Enterprise Research Center, the legal sector is pretty stable without a lot of room for innovation, but this doesn’t mean that a creative marketing plan wouldn’t be beneficial. As the legendary marketing strategist Al Ries says, “The strategy, the sense of timing and the exact moment, are the high peaks of marketing. Everything else is just hills.” Even though companies with a legal department carry out most of their work internally, a Deloitte research study reveals that 52% of internal departments are considering contracting legal services from non-traditional law firms. This creates an opportunity for small and medium businesses that are trying to attract more customers. To stand out from the competition, you must analyze and know how to take advantage of the opportunities that arise in our environment. In this post, you will discover how to take advantage of 5 marketing strategies for lawyers to boost your business. Ready? Competition in the legal sector is fierce and the number of lawyers and law firms that offer the same legal services increases year after year. The American Bar Association’s (ABA) website shows that there are more than 25,000 members just in the Labor and Employment Law section. As a small or medium-sized company, you may have noticed that there are hundreds of law firms that offer the same services as you. They may already be promoting their business through the Internet successfully, too. Competing directly with them means entering into a long and painful marketing battle. For this reason, the first marketing strategy that we propose is to specialize in a niche—focus on a specific type of service or customer. Use niche marketing to demonstrate to your potential clients that your company is an expert in the specific service and that they will be in the best hands by hiring you. 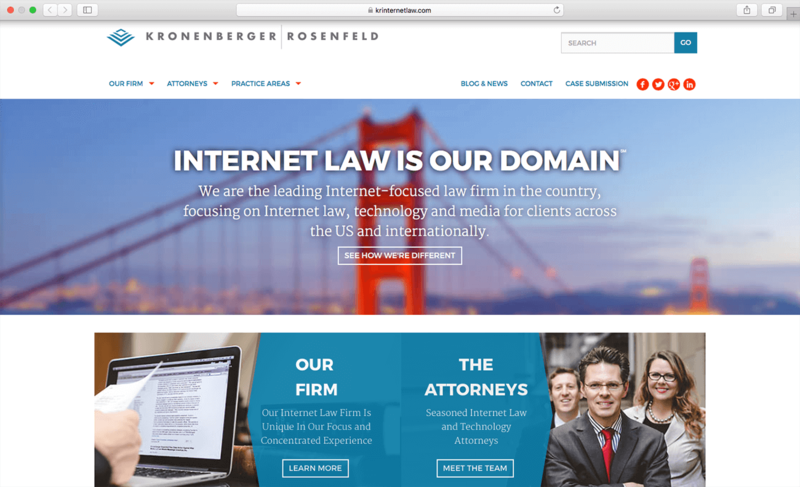 For example, the US law firm Kronenberger Rosenfeld specializes in Internet, technology and multimedia law and is one of the leading firms in the country in this field. Differentiation: Focusing on a specific niche will give you added value that will differentiate you from those law firms that offer all kinds of services. Persuasion and credibility: The more specific your niche is, the easier it will be for you to establish yourself as an authority. People will then begin to perceive you as an expert in that specialized area of ​​law. The possibility of setting higher prices: According to Philip Kotler, considered the father of modern marketing, people are willing to pay more for a specialist that meets their needs. Recognition: According to Steven M. Gursten, partner of Michigan Auto Law, a firm specializing in traffic accidents, if you specialize in a specific niche, it’s more likely that other lawyers will refer you cases. It can also improve the chances of the media contacting you for information about your area of ​​specialty. You can even be sought after to talk at seminars. Cost reduction: According to a publication by the ABA, niche marketing allows you to focus your resources, your time and your money on a specific group or industry. This is less expensive than mass marketing and it’s a significant advantage for small law firms or freelance lawyers who can’t afford to invest millions of dollars in advertising. However, we must also bear in mind that specializing in a specific service also involves risks. The size of your market will be smaller and the possibilities of growth will be limited. Therefore, you should study the potential of your niche and its long-term profitability in depth before establishing yourself as a specialist. Did you know that 92% of all searches in the world are made through Google? The importance and omnipresence of the search engine is already something undeniable and its evolution with the introduction of Google AdWords—the pay-per-click platform used to create ads on Google results pages and other sites—has brought clear advantages for those companies that want to gain visibility and increase their sales by spending less and earning more. Surely you’ve heard the phrase, “if you’re not on the first page of Google, you do not exist.” Unfortunately, it is a reality. Academic researchers say that 91% of users do not go beyond the first page of results and more than 50% do not even click beyond the first three results. Even marketing authorities say that “the best place to hide a dead body is page 2 of the Google search results” and they may be right. It places you in the top positions on Google in less than 24 hours: Positioning your website naturally through SEO techniques can take months. 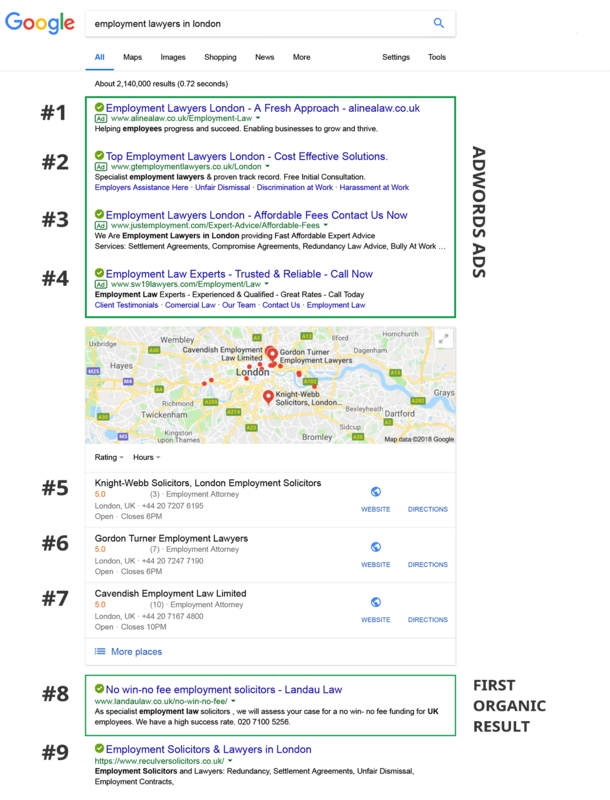 Getting the first position among the organic results also means that you’ll actually appear in the eighth position since the first four results are ads and the next three are Google Maps sites. In contrast, Google AdWords lets you pay for your website to appear within the first results on the search pages based on the keywords you choose. If you are now wondering if people click on the ads, the answer is yes. The American company iLawyerMarketing did a click test on a search related to legal services and the results showed that the first three ads were clicked on more than the first three organic results. Advertising on Google is relevant and timely: Ads on Google are not intrusive since they only appear when users are looking for a solution to a problem or need. In this case, searchers are trying to find a lawyer so users who see your ad on Google will be much more receptive than those who, for example, see an advertisement for your firm in a local magazine. 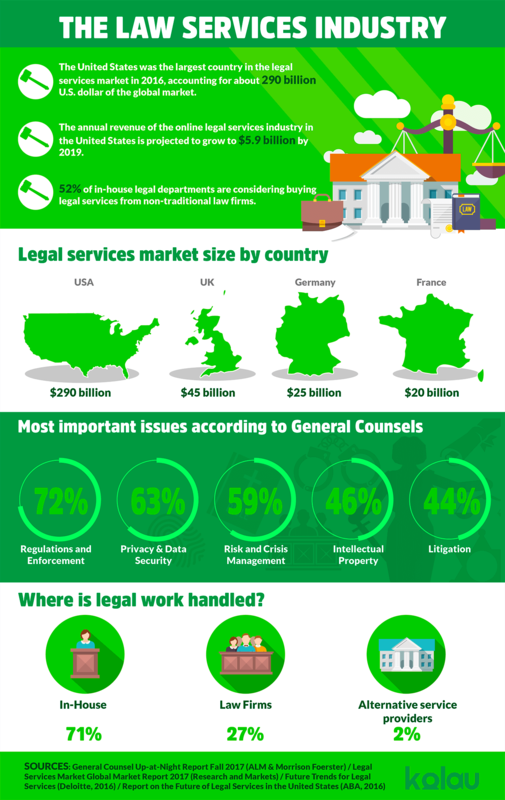 People search for lawyers through Google: According to Google Trends, searches that include the word “lawyers” have maintained stable popularity over the past five years. This confirms that Google can help you reach your target and acquire new customers. The legal industry has a high conversion rate with AdWords: According to a recent analysis of WordStream, legal industry ads in Google have an average conversion of 6.98%, the second most significant percentage of transformation in comparison to 15 other sectors. With AdWords, you spend less: Launching a campaign in AdWords usually has a lower cost than buying advertising space in traditional media such as television, radio or newspapers. You only pay when users click on your ad so that you can get more out of your marketing campaigns. If you’ve never used AdWords and want to know more about how it works, we recommend our Google AdWords tutorials. However, if you do not have time to figure out how AdWords works and you want to save yourself from hiring an agency that creates and optimizes your ads, then the Kolau platform is for you. With Kolau you can do it yourself in the easiest and fastest way. Try it! Andy Taylor, associate research director at Merkle, says in Search Engine Land that the organic and the paid positioning are complementary and that it is essential to understand how they work together. Although investing in Google AdWords and optimizing your campaigns make it possible to appear among the first three results of Google, it is not always possible to achieve it for all of your relevant keywords. The same is true for organic positioning. According to a Moz study, the click-through rate (CTR) of organic results has lost 25% of the share of clicks on computers and 55% on mobile devices. While it is true that changes introduced by Google in recent years have impaired the performance of organic results, users are still clicking on these types of results. For that reason, the more presence you get in Google SERPs —be it organic or paid—the better. Here are some ideas and essential tips to successfully implement a content and SEO strategy for lawyers. However, to obtain the best results, it is advisable to hire a professional SEO expert. Create a blog on your website and publish educational and informative content about the legal sector that other sites and organizations wish to share. Creating high-quality content that provides value on issues related to justice can help you increase the credibility of your website. This can help you get a better position in Google. How? If your posts contribute educational or informational value, they are more likely to be shared or linked to by related sites or organizations. Each time they are shared, you will get high-quality inbound links which Google will take into account when positioning your website on their search result pages. 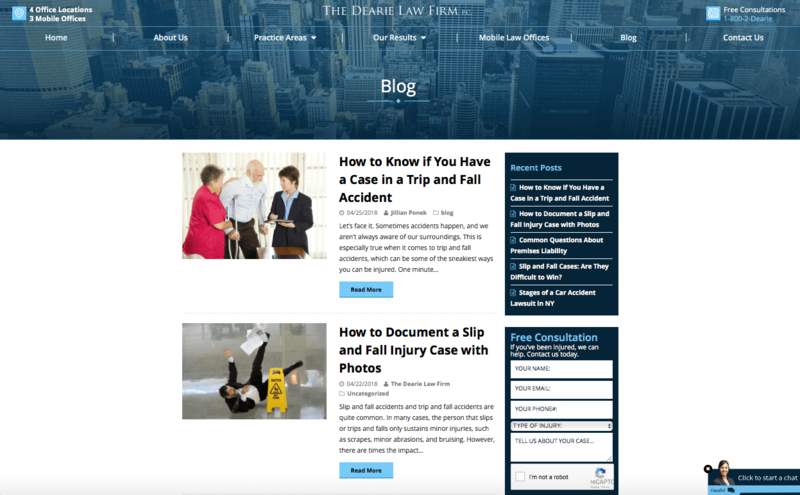 For example, the New York law firm The Dearie has a blog on its website that publishes posts with useful and practical tips to deal with situations related to its field of specialization—accidents. Optimize your website for SEO: SEO experts have identified factors that influence the positioning of a site. Most agree that, in order for Google to understand what your page or blog post is about and to rank your site higher for the keyword you have chosen, you have to make sure the keyword is within the title of the page, in the URL, in the subtitles, in the first paragraph of the content, and repeated several times throughout the content. The keywords should also be in the “Alt” labels of the images and in the meta tags. On the other hand, you should also make sure to include internal links that allow navigation between the different pages of your website as well as external links from third party websites that point to your website. Your website should also have a responsive design that adapts to the screens of mobile devices (Google started penalizing non-responsive sites in 2015). Finally, the loading speed of your website should be as fast as possible. Create long, high-quality content: Content marketing has undergone a significant change since the number of articles on your site is no longer as significant as the quality of the articles on your site. Google is no longer impressed by those hundreds of short articles with superfluous content that nobody wants to read. Now, it awards the first position to websites that include substantiated, long and authoritative content that provide relevant and definitive information about a topic. Several studies have shown that pages or posts that contain more words tend to get better positions in Google and, therefore, more traffic. As proof of this, after analyzing its blog, HuBSpot discovered that the posts with more organic traffic were those that had between 2,250 and 2,500 words. Social media can become a very interesting marketing channel for lawyers since it is a great help in customer acquisition and loyalty. In addition, it is perfect for branding. In a Social Media Examiner study carried out in 2016, 89% of salespeople indicated that their efforts in social media generated more exposure for their businesses. The fact that you can build a base of followers that can receive your content on a daily basis helps you to stay in their top of mind. Still, to get this loyal base of followers you must generate exciting content for them. Several experts argue that only 20% of the posts you post on your social media should talk about your company and 80% should focus on the interests and concerns of your target. Here are some tips and ideas you can put into practice to get the most out of social media. Use LinkedIn to reach your target audience through groups: According to an ABA Techreport 2017, LinkedIn remains the most popular social network among lawyers and law firms. In that report, 54% of the lawyers surveyed claimed their law firms use the site. Since it is the professional network par excellence, most lawyers and legal service companies use it to network and stay up to date on their industry. However, it can also become a powerful acquisition tool. Do you want to know how? This network allows you to participate in discussion groups to share resources, knowledge, and experience. If you look at your potential clients’ LinkedIn profiles, you can see what groups they joined. By participating in groups where your targets are located, you can contribute opinions, information or valuable resources about your area of ​​expertise. Those potential clients will read what you say in the group and will be more likely to turn to you for legal services than other firms or lawyers who they haven’t interacted with. Create video content to increase the reach of your posts on social media: According to Socialbakers, videos get 135% more organic reach than photos on Facebook. More so, according to an investigation by Tubular Insights, 73% of B2B marketers say that the use of videos has had a positive impact on their marketing ROI. You can create educational videos that offer useful advice about everyday legal issues or problems aimed at your target audience. You can also make videos of testimonials from your clients or videos about the day-to-day operations of your law firm. 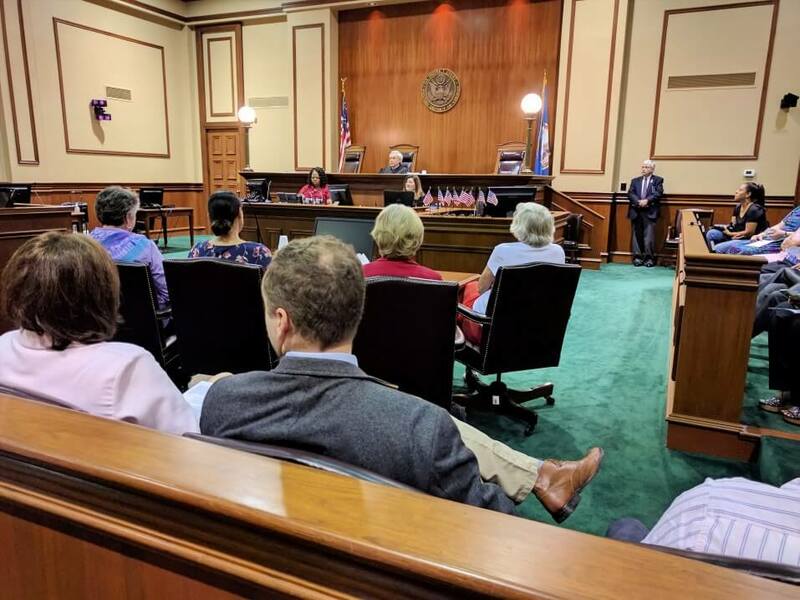 Even brief audiovisual pieces where you comment on news or current events regarding legal aspects of your area of ​​specialty can draw traffic. An excellent example of this is the following video from the Canadian law firm KPA Lawyers Professional Corporation in which they offer educational content aimed at their target niche through an explanatory video drawn by hand—a format that has gained much popularity in social media. There are plenty of ways to create great video content for your website, you just need to get a little bit creative! Share the content of your blog on social media: An excellent way to create interesting content for your social media followers that can simultaneously generate more traffic to your website is sharing links to your blog posts. Make sure you create attractive posts that generate interest and make your followers click on the link to read the posts. 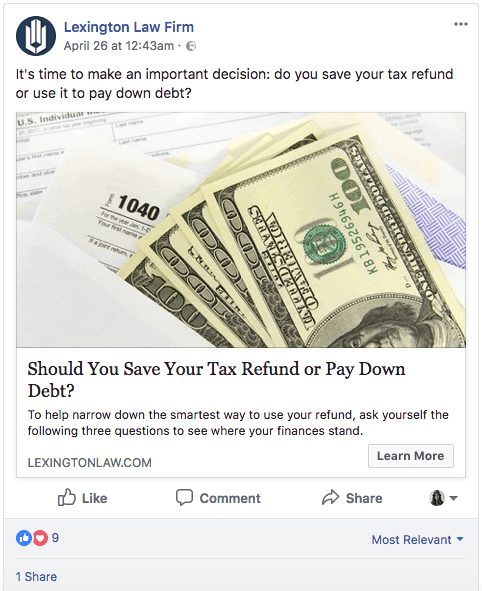 Below you can see an example of a publication on the Facebook page of the American law firm Lexington. In the example the firm manages to highlight the importance and usefulness of the subject of their article through a question that sparks reflection. Take advantage of the trending topics on Twitter to gain visibility: Twitter is a social network where immediacy and what happens nowadays prevails. This means that the published content expires quickly and disappears from the map. In general, when there is a significant event in the social, political, technological or cultural field there are often hashtags about the topic in which a lot of people are actively participating. This creates the well-known phenomenon called “Trending Topic.” Try to monitor these hashtags to find opportunities to join the conversation with relevant resources and opinions related to the topic. You can tweet by linking to a post on your blog that provides information related to the Trending Topic or even create specific content to take advantage of it and generate traffic to your website. Create retargeting campaigns through Facebook or Twitter Ads: Surely you’re familiar with those ads that follow you everywhere after visiting certain websites. These are called retargeting ads, also known as remarketing ads. The decision to choose a lawyer can take several days since most users who visit your site also visit other law firms and compare them before making a decision. If you create a retargeting campaign on Facebook or Twitter, you can stay in the mind of your potential clients and they will be more likely to come back to your website to request your services. According to a DataXu study, retargeting can increase your conversion ratio by almost 150%. As Mike Volpe, CMO of Cybereason, says, “do not be afraid to be creative and experiment with marketing.” Even if your sector does not lend itself to innovation, the way in which you manage to attract customers and communicate with them can always be creative. The key is to know your target well. If you know your audience in depth, you will know where to find potential clients and how to attract more. Did you like this post? If you want to know more about online marketing strategies for lawyers, you can also check out our previous post about Email Marketing for SMEs.